A wedding day is a unique day for everyone. On that day, we begin a new stage in our lives. That makes a wedding day the very special day. So, why wouldn’t we wish to make our wedding day as unique as possible? If you decide to marry in Halkidiki, you can rent a BabaSails yacht and spend a wedding day of your dreams. Where BabaSails Yachting’s yachts can take you? In Halkidiki, Greece, that is not a problem. There are many isolated coves and beaches throughout the area featuring beautiful environment. Our skipper can take you to any of them. Once you arrive, you and your guests can have a party of your lifetime. Next, we can take you to Thessaloniki and its celebrated seaside promenade. There, you can take a walk along the beautiful promenade or enjoy a carriage ride. You will agree that a combination of a horse-drawn carriage and a luxury yacht is quite appealing. What can you do on a yacht during your wedding day? Or if you prefer an intimate celebration, you can have it with your partner, a few guests and with a blue infinity around you. Brides always look marvelous, that is sure. Now, imagine how much better she will appear on the open sea. Especially with her dress contrasting with the turquoise water and the light blue sky. Finally, why using your sailing yacht only for photo sessions and for getting around? You can also arrange the wedding ceremony on our boat. All you need to do is to take care of the formalities. 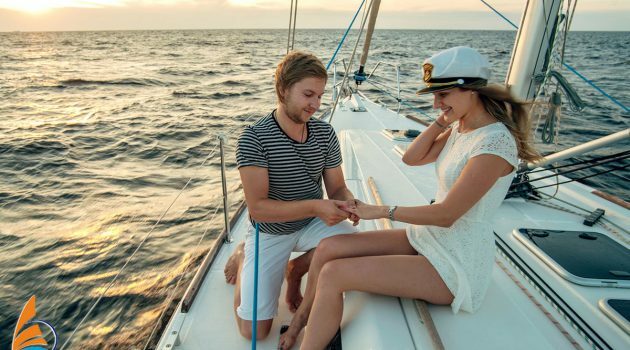 You can leave to BabaSails Yachting to choose a suitable environment where you will say “Yes”. What else BabaSails Yachting can do for you? If you are among those people that daydream about a wedding somewhere far away, BabaSails Yachting can help you with that. There are many suitable secluded places all over Halkidiki we can take you to. Or we can take you on a sea cruise from which you will return with marvelous photos. After all, you have a right to any wish on your wedding day and we are here to grant it.